Easy to make and very delicious dessert. First step is to combine in a bowl the condensed milk and all-purpose cream and whisk. Then arrange the graham crackers on a dish pan. Slowly pour the cream over the crackers and spread the mango on top of the cream. 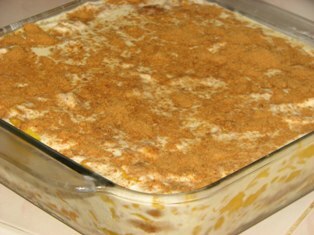 Put another layer of graham on top of the mangoes and repeat the process. Finaly, garnished the top layer with crushed graham and chill for at least 2 to 3 hours before serving. Serve these delectable dessert on every occasion and Enjoy!